Description : Ayurveda is not only meant for curing diseases but also helps in keeping healthy person healthy. Foundation for healthy body and mind is laid in childhood . It is the best time to build and improve immunity among kids . 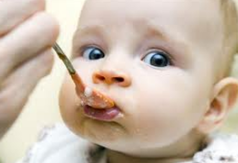 Ayurveda beliefs that most of congition power of child is developed before age of two after that only memory improves. As gold is said to be the best for improving congnition ayurveda has kept "Swarna Prashan" under sixteen sanskar of our life. Swarna Prashana : The word Swarnaprashan is combination of two words 'Swarna' ' Prashan' . Swarna is a common word and refers to nobel metal gold . Prashana means to act of eating or consuming . Swarnaprashana thus means act of consuming gold in prescribed dose and quantity. It is one of the sixteen sanskars essenstial for children. It can be done for kids from 0 to 16 years . In today's environment, when everything is chemically processed it is required for kids to have sharper mind and healthy body. its Good For the Health , baby care products for the better life in feature.